(2R,3S)-N-tert-Butoxycarbonyl-3-amino-1-chloro-2-hydroxy-4-phenylbutane (1b) is key for the synthesis of the antiviral drug atazanavir. It can be obtained via the stereoselective bioreduction of (3S)-3-(N-Boc-amino)-1-chloro-4-phenyl-butanone (1a) with short-chain dehydrogenase/reductase (SDR). However, the stereoselective bioreduction of this hydrophobic and bulky substrate still remained a challenge because of the steric hindrance effect and low mass transfer rate. 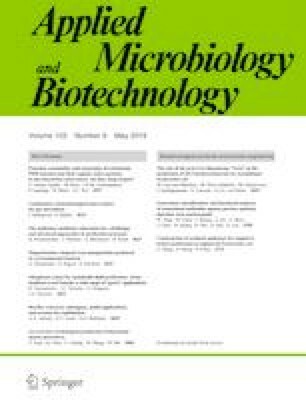 In this study, SDR isolated from Novosphingobium aromaticivorans (NaSDR) having low activity to 1a, which was engineered to enhance catalytic efficiency through active pocket iterative saturation mutagenesis (ISM). The obtained mutant (muSDR) (G141V/I195L) had 3.57 times higher kcat than the wild type (WT) towards 1a. Molecular docking analysis revealed considerable differences in the distance between the substrate and catalytic residues in WT and mutant SDR. Moreover, muSDR reduced 15 ketones with excellent enantioselectivity, indicating broad substrate acceptance. After optimization of expression and reaction conditions, the conversion was completed in a scale-up reaction (500 mL) using 50% toluene with 500 mM substrate without additional NADH. These results show that muSDR may be a valuable biocatalyst for future industrial applications. The online version of this article ( https://doi.org/10.1007/s00253-019-09781-4) contains supplementary material, which is available to authorized users. This work was supported in part by grants from the National Natural Science Foundation of China (No. 81773616), Natural Science Foundation of Shanghai (No. 16ZR1435400), Program of Shanghai Technology Research Leader (No. 17XD1423200), and the Seed Fund Program of Shanghai University of Medicine and health Sciences (SFP-18-22-07-002).